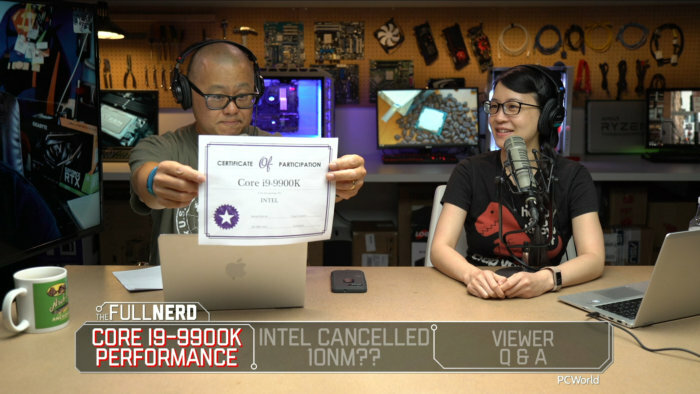 In this episode of the Full Nerd, Gordon Mah Ung, Brad Chacos, Alaina Yee, and Adam Patrick Murray mine the knowledge gleaned from our Core i9-9900K review and discuss where Intel’s first-ever 8-core, 16-thread consumer chip fits in the wider world of processors. It’s the world’s best gaming CPU, but what does that really mean? After that, we delve into SemiAccurate’s report that Intel has canceled its long-maligned 10nm CPU process—and Intel’s rapidly issued denial. It’s a mess. So who’s telling the truth? We won’t know for sure until holiday 2019 (at the earliest), but it might wind up depending on what your definition of “10nm” is. Finally, we spend some time answering live questions from viewers. You can witness it all in the video embedded above. You can also watch The Full Nerd episode 73 on YouTube (subscribe to the channel while you’re there!) or listen to it on Soundcloud if you prefer the audio alone.